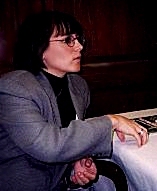 Marla P . Messing serves as President and Chief Operating Officer of the 1999 FIFA Women's World Cup Organizing Committee. The position is the latest in a distinguished career, during which she has been at the center of many of soccer's most complex activities. An attorney by training, Messing left a rising law career to join the 1994 World Cup Organizing Committee in 1992, where she became one of it's most influential members. As Executive Vice President, Messing sat on the four-person Executive Management Committee which was responsible for all World Cup business operations. In addition, Messing managed ticketing, entertainment and special events for the committee. Under Messing's direction, the World Cup sold 3.5 million tickets-largest number of tickets ever sold for a World Cup. Messing has successfully staged exciting and varied soccer and soccer-related events. At World Cup USA, 1994, she staged a multi-faceted FIFA Final Draw in 1993, which involved thousands of participants and dozens of separate activities, and World Cup Week at the Hollywood Bowl, which included five different professional performances. Messing also oversaw the production of the Three Tenors Concert at Dodger Stadium as well as the World Cup song, music and video packages. At the conclusion of the tournament, Messing turned her attention to the wind-down operations, smoothly closing out the operation of an event that involved nine venues, more than 400 employees, 10,000 volunteers and produced a surplus of approximately $60 million. 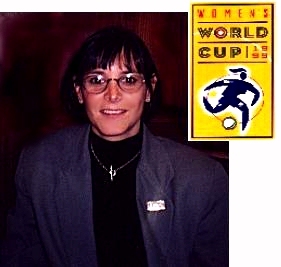 Following her duties at World Cup USA 1994, Messing joined the initial management group which oversaw the successful launch of Major League Soccer. As SEnior Vice PResident, Messing's responsibilities included assisting in the development and drafting of the business and financial plans, establishing the league's burgeoning licensing program and staging the league's first major events - MLS Unveiled and the MLS Inaugural Game, which attracted a nationwide television audience and a sell-out crowd in San Jose, California. Messing began her professional career at the Latha & Watkins, one of the prominent law firms in the country, where she specialized in corporate and securities matters. She is a graduate of the University of Michigan at Ann Arbor and holds a juris doctorate from the University of Chicago. She and her husband live in Brentwood , California with their two daughters. 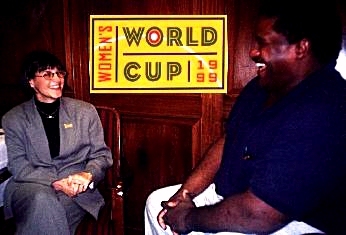 La Cancha recently conducted an exclusive interview below with President Messing during the WWC venue tour at Giants Stadium in preparation for the 1999 Women's World Cup. Q: Would you consider your organization to be on course at this stage in terms of the preparations necessary for 1999 Women's World Cup? A: Yes. We are on schedule and our progress has been excellent. This tour is very operationally oriented. The purpose is to go to each facility with all of our different departments, with our press group our broadcasters, marketing, game operation people, and tour the facilities and really start to make divisions to determine who will work where. We are deciding for example where will the press box be, where will the FIFA Tribune be, "hospitality"as well our "main street concept". However, all of the facilities are already geared towards presenting major events which is very conducive to making this type of event run smoothly. Q: What is the status of advance ticket sales. I understand that there have been more tickets sold in advance of the Women's World Cup than were sold for the men's World Cup during their advance sale period. A: It's not more tickets but rather more tickets on a relative basis. In 1993 during this point in time bout 20% of the tickets were sold. At the same stage of advance ticket sales for WWC we have sold 30% of our tickets. So on a relative basis we are ahead of where we were for the men's World Cup. But what is interesting to note is that for the 1995 WWC in Sweden they sold 112,000 tickets. We have already sold over 150,000 tickets for this tournament and we have eight months to go! So we are going to obliterate what they did in Sweden and we feel that we will set records for a women's only sporting event in terms of the number of people in the stadiums. Q: The gold medal match at the 1996 Olympics was an incredible challenge. Do you anticipate seeing that type of turnout for the Rosebowl finals match on July 10th, 1999? A: We hope to see that right here at Giants Stadium. Sanford stadium held somewhere around 75,000 people for that game and if you really work hard you can get 77,000 people into Giants Stadium. So we hope to break that record with our opening game in Giants Stadium and then break it again when we go to the Rosebowl on July 10th. Q: How many tickets have been sold for the Giants Stadium venue thus far? A: I don't have the exact numbers in front of me but I believe it is around over 30,000 for the two events being held at Giants Stadium. Q: What were you considerations in choosing Giants Stadium as a venue for the WWC? A:Giant's Stadium is one of the premier facilities in the country and it has hosted many major events including the men's World Cup. So there is no doubt that this facility is equipt to host our event. Q: How do you anticipate this Women's World Cup's impact on women's soccer in America? A: Well, I began involved in this tournament in late 1996. At that time if you looked at average attendance for women's soccer it was about 4500 people per game. If you look at the last six or seven games of the US Women's National Team they are averaging between 12-15,000 people a game. So you can already see the impact that tournaments are having on the women's game. Q: In terms of the playing surface here at Giants Stadium, although the natural grass surface which has been installed during the regular MLS season is reported as being excellent, there have been problems with regard to scheduling and removal of turf for football. Will the WWC utilize the same turf -in-tray system which has now been removed and stored in another lot here at the stadium? A: We expect to utilize the same grass system that has been established for the Metrostars. The tournament takes place from June 19th to July 10th which is during the MLS season so we wouldn't install a separate grass field for the tournaments. Q: Do you know if your new daughter Samantha like soccer? A: Samantha loves soccer..Samantha's just learning about eyesight. She a little bit to young but I have a 23 month old who's just about to turn 2 and she already kicks the ball into the net that we have for her so she's all set. Q: What is one of your biggest challenges in organizing this event. A: There are always challenges but if I might step back for a moment, people look back at the 1994 World Cup and say it was easy and such a huge success. But I started working for that tournament 1n 1992 and the promotional work that we had to do for that tournament was just tremendous. And that work had to be done even though the tournament had about a 100 year history . Now flash forward to 1999, you have the history of the 1994 event but because it's women's soccer there are a whole new set of challenges. Our aim is to convince the people that women's soccer offers the same kind of relative potential that the men's World Cup had. One challenge in particular is getting people interested in the games that don't involve the US Team. That's really an education process. Those people who are experienced in the sport know that Germany, Norway, China and Brasil all field excellent team which play very exciting, interesting soccer but the general public isn't aware of that. So for us it's explaining and educating them about those other teams that will be exciting to watch. Although the US team is excellent, on any given day, any of the four teams which I mention can be a major challenge to the US team. Q: Are there plans in the works to introduce the American public to the other international teams. A: Yes the biggest plan we have right now is for the final draw. We're going to have the first- ever FIFA Women's World Allstar Game which will be aired on ESPN. The idea will be to have the "US vs.The Rest of the World". It will feature the best players from the above teams vs the US women. At half-time we will have the final draw. It will be a 2 1/2 hour block on television to really explain the WWC to the general public. It is also excellent way of exposing the American public to the individual international players who will be participating in the WWC. Q: Finally, how is the organizing of this event and the tour impacting on your personal life particularly having a new addition to your family. A: It's very hectic it's also very exciting. The planning of a World Cup or any major international sporting event can be very heady. At the same time as you point out I just had my second child. I now have an eight week old and one that is almost 2 years old so there are certain sacrifices that I had to make to make certain that both worlds work. However I am very fortunate that I have a great husband who shares a lot of the responsibility, and a terrific nanny who also makes sure the kids are taken care. Q: What are you plans for the time after the WWC? A: My plan is take a lot of time off at the end of the WWC and spend it with my family. Main Page | Soccer Links | Store | E-Mail | ADD YOUR LINK!